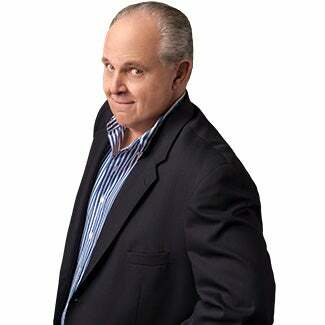 RUSH: The left today — the Drive-By Media and the Democrats — are beside themselves. 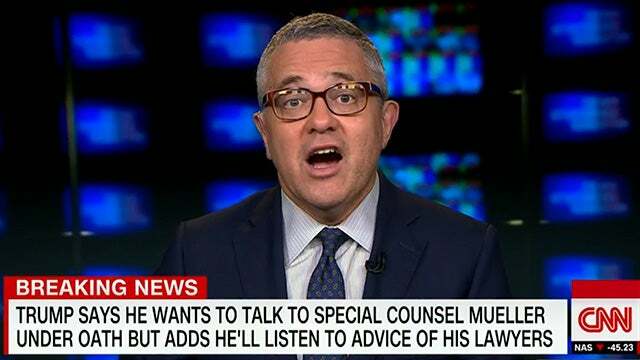 Jeffrey Toobin on CNN was unable to put together a sentence. He had to turn it back over to the CNN host while he composed himself over the fact that Trump… He did a little press gaggle before leaving for Davos and it’s when he said, “Yeah, I’ll talk to Mueller. I’ll go under oath. There’s no collusion. Nothing happened! I’ll be glad to talk to him,” and he had had some other choice things to say about the investigation. And the Drive-Bys can’t believe it. They can’t believe that Trump would talk this way. They can’t believe that Trump thinks he’s innocent. They can’t believe that Trump thinks he didn’t do anything and he’s out there saying this! They can’t believe that Trump would submit to going under oath. They can’t, and they’re just… “This has never been done before, somebody attacking the prosecutor this way!” I guess they’ve forgotten how they all went after Ken Starr. But it… The way Trump gets to these people is just delicious! No matter how much time goes by, no matter what, they can’t accommodate Trump being alive in Washington, D.C., as president of the United States. They just can’t accept it. Now, they get up every day hoping that day is the day for some kind of smoking gun news that’s gonna send Trump packing. The added second half of that dream is that they individually are gonna be the people that find that smoking gun news that’s gonna send Trump packing. And instead, not only is Trump not going anywhere, the special counsel’s investigation the apparently hasn’t been able to find anything on this bogus collusion with Russia story. Trump is prospering, he is triumphing, he’s getting his way. RUSH: I mentioned earlier in the busy broadcast that Jeffrey Toobin was so flustered by a Trump remark that he could not complete an interview on CNN. He had to turn it back to the host Wolf Blitzer to recompose himself. I want to play this for you. This is in response… You know, Trump had an audio-only press gaggle before leaving for Davos. It was in this press gaggle that Trump said (paraphrased), “I’ll talk to Mueller. I’ll go under oath. “I don’t care. I didn’t do anything. There wasn’t any collusion. There hasn’t been any obstruction! I’ll talk to Mueller; I’ll do anything.” But he said some other things too, and among those other things was a reference to Andrew McCabe, No. two at the FBI, and this just sent Toobin and many in the media into orbit in anger. It’s sound bite No. 20. Here is Trump talking about McCabe. THE PRESIDENT: McCabe got more than $500,000 from essentially Hillary Clinton, and is he investigating Hillary Clinton? FEMALE REPORTER: So should he go? FEMALE REPORTER: Do you regret having him as your acting FBI director, then? THE PRESIDENT: You know what? I keep out of it. You’d find that hard to believe. That’s the way it fell. He’s been there. MALE REPORTER: Did you ask McCabe who he voted for? THE PRESIDENT: I don’t think so. FEMALE REPORTER: You don’t think you did? THE PRESIDENT: No, I don’t think I did. FEMALE REPORTER: You don’t! Is it possible? THE PRESIDENT: I don’t know what’s the big deal with that. Who did you vote for? THE PRESIDENT: I don’t think that’s a big deal. You know, I saw that this morning. I don’t remember asking him that question. FEMALE REPORTER: Is it possible you did? THE PRESIDENT: I think it’s also a very unimportant question. RUSH: “Is it possible you did? Did you ask him who he voted for?” That was another story. “Did you ask may be who he voted for? As though, “You can’t do that! You can’t ask the FBI guy how he voted.” The press is desperate. Trump says, “I don’t think I did that. I don’t think I did. I don’t know what’s the big deal about it. Who’d you vote for?” he’s asking the media. I think it’s a big deal. And then the reporterette says, “Is it possible you did? Is it possible you did?” Trump said, “It’s a very unimportant question.” So it’s that that forms the basis of Jeffrey Toobin trying to explain this and react to it later on CNN. TOOBIN: The excerpt is really pretty remarkable for the number of inaccuracies, conspiracy mongerings (sic) and outright just strangeness. Uh, I mean, first of all, um… the — the — the — I mean… (sputtering) H-h-hillary did not give any money to, uhhhh — to, uhhhh, uh, uh McCabe’s wife when she ran for the state senate in Virginia. It was Terry… It was Terry McDonnell. TOOBIN: Uh, McAuliffe. I’m sorry. M-m-mcAuliffe, who’s the governor of — of Virginia, who is — yes, he’s a friend of the Clintons, but he obviously is very much involved in Virginia politics and would have every reason to support a Democrat in — in that seat. Uh, uh, uh… (sputtering) The — the — I’m trying to keep track of — of — of all — all — all — the things he said. I mean, there was not any… Ummm… Gosh. I’m sorry. I — I — I — I’ve lost my — I lost my train of thought in there. Buh… Come back to me on this, and I will, uhhhh — I — I’ll — I’ll — I’ll fill you in further. RUSH: He could not keep… He was so flustered and so unbelieving of the way Trump was acting and what he was saying and how he was behaving that Toobin couldn’t believe it. He couldn’t believe that Trump would say this kind of stuff, and he lost his train of thought trying to stay mad about it. So he had to punt and ask Wolf Blitzer to come back to him later. I have to take a break, but only because I really do.